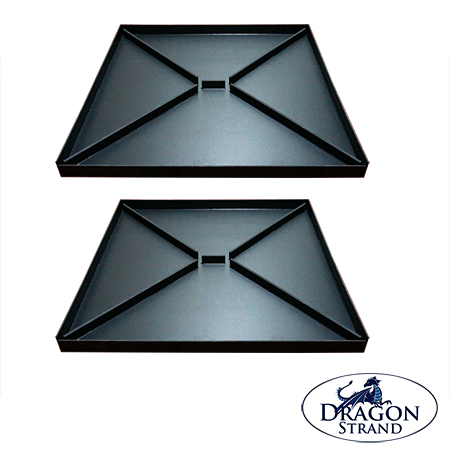 This product is a bundle of two 25″ heavy duty drainage trays. Ordering one of these will get you two trays. This drainage tray has been designed to be compatible with all manufacturer’s square cage sizes from 24″ x 24″ and below. Make sure your counter space is big enough for the outside dimensions and your cage fits within the inside dimensions. This design is unique with its “X” support pattern giving it ample support all along the bottom. These thick supports allow heavy potted plants to be placed in the cage without fear of the cage bottom falling through. The front edge is lowered to allowed use of the lower flip door on the cages while the sides and back are slightly higher to ensure the cage can not easily be pushed off the tray. 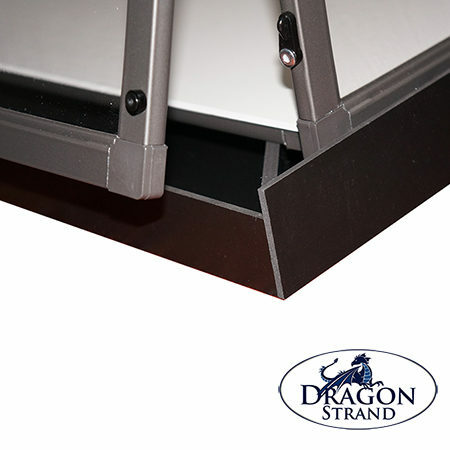 The Universal 25″ Heavy Duty Drainage Tray provides a drainage solution for ReptiBreeze, DIY Cages, LLL Reptile, Jungle Hobbies and, of course, Dragon Strand cages. Most manufacturers do not offer a drainage tray. A drainage tray sits under and outside the cage. A substrate tray sits inside the cage. Chameleon keepers know that a substrate tray inside the cage is wholly inadequate to act as a water catcher. The soup of water, feeders and chameleon poop is the height of unsanitary conditions and poor husbandry. For the sake of your chameleon and your nose, avoid poop soup and use a proper drainage tray! Note: With this product you leave in the floor that comes with your cage. We do recommend drilling small holes numerous places along the floor of your cage so that the water has an easy way to drain into the drainage tray. Do NOT drill holes in your drainage tray. (Just making sure that is clear.) This article on Drainage should help with any questions. 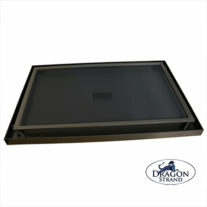 The Dragon Strand Universal 25″ Heavy Duty Drainage Tray has been designed to be compatible with all manufacturer’s square cage sizes from 24″ x 24″ and smaller. A proper drainage tray sits under the cage collecting the excess water outside the cage. A water catch outside the cage avoids the unsanitary soup of excess misting water, drowned feeders, and chameleon waste. Sound disgusting? It is. This drainage tray will collect that water outside the cage. Heavy Duty. For the keepers that like to have potted plants on the floor of their cage, this drainage tray is for you. 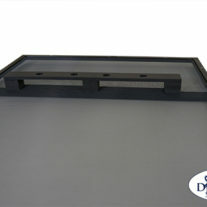 We have included a heavy duty X-pattern support all along the tray to support large potted plants. Compatibility. This drainage tray is specially designed to accommodate square shaped cages 24″ x 24″ and below from any manufacturer. 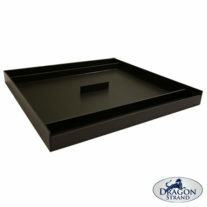 This drainage tray gives owners of ReptiBreeze, DIY Cages, LLL Reptile and Jungle Hobbies a drainage tray solution. The “X” support pattern gives ample support for these different cage sizes making it the most robust and versitile drainage solution available.